Last week saw the release of a new set of stamps. 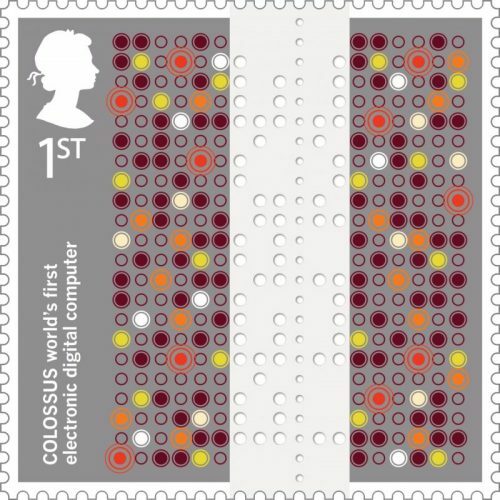 One was to celebrate Tommy flowers and his greatest invention, the Colossus Computer. An old friend wondered what was on the punched tape in the middle of the stamp. He dug out a pen and a Baudot Code chart and went to work. He wasn’t the only one. I dug out the same code and made a start. If you want to try it then just use the below helpful graphic. Just remember to take note of the sprocket hole position. I did the same and get a load of gibberish, and a couple of command codes. It didn’t make any sense. Even if it was decoded via a Colossus emulator! The stamp is below. See if you can figure out what the code actually says. If you can’t, I can give you the answer. Just click here and the answer will become obvious! I’m not going to spoil the surprise as it’s a very nice one. Something that you may spot straight away or get stumped until you stumble upon it. You will kick yourself if you miss the obvious! I just got the following line of gibberish when I decoded the paper tape. Do you agree with my decoding?